While festivals can be a great place to sample live bands with their 40 minute sets, sometimes you just wish that the allotted time could be extended. So after seeing a couple of, far too short, Hatful of Rain sets at the last couple of Maverick Festivals, it was a pleasure to see the band find the time and resource to undertake some headline dates around the country. The Sussex based quartet have developed their own niche on the London and south coast folk n’ roots circuit with a pair of impressive album cuts but this brave venture north presents an opportunity for the band to widen their brand of harmony driven–Americana influenced acoustic music. Of course growing a live following outside your core area can take time and despite a slow ticket sale start, a highly respectable Kitchen Garden turnout soaked up this initial savouring of the Hatful’s talents. These are centred on the golden vocals of Chloe Overton, often playing foil to the harmony slots from Fred Gregory and Phil Jones, although the latter two occasionally take the role of lead vocal around the iconic single mic. 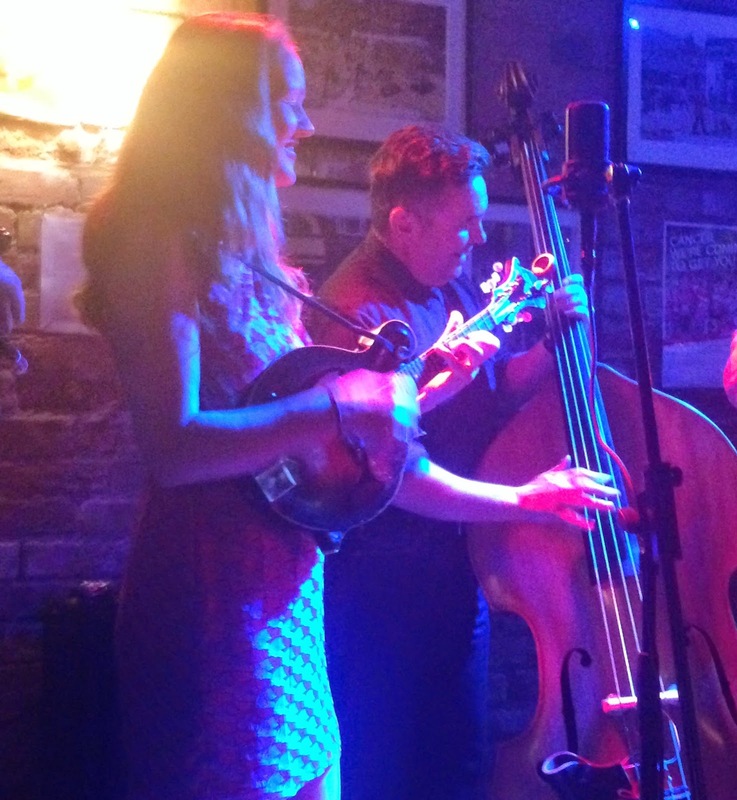 All three show their adept skills on assorted string instruments ranging from bass to banjo to mandolin to guitar, all requiring not a single bolt of power. The energy comes from their blinding pickin’, all serenaded by the distinguished fiddle playing of James Shenton. With the vocals and musicianship intact, the final piece of the jigsaw is the songs and Hatful of Rain come up trumps in this category with free flowing melodies and sharp lyrics bringing their thoughts and observations to life. Over the duration of this 90 minute show split across a pair of sets, the band served up nearly 20 tunes, of which a majority are originals and a couple of instrumentals driven by the fiddle playing of James. These included his own composition ‘Stranger’ taken from the band’s latest album and a French Canadian tune which the band ribbed James about him claiming it. The band’s latest album, THE MORNING KEY, only came out in May and was unsurprisingly the focal point for this evening’s gig. It was particularly pleasing to hear the two stand-out tracks deep in the second set. ‘Good Way (To Make A Bad Man Worse)’ sounded as clear and inspiring as its album track recording while the spellbinding ‘One Promised Land’ delivered by three voices and a fiddle was a super closing moment. As per usual a backseat album track leaps forward on stage to live prominence and the delightful waltz ‘Cannot Be The One’, beautifully sung by Chloe, was this evening’s wild card treasure. 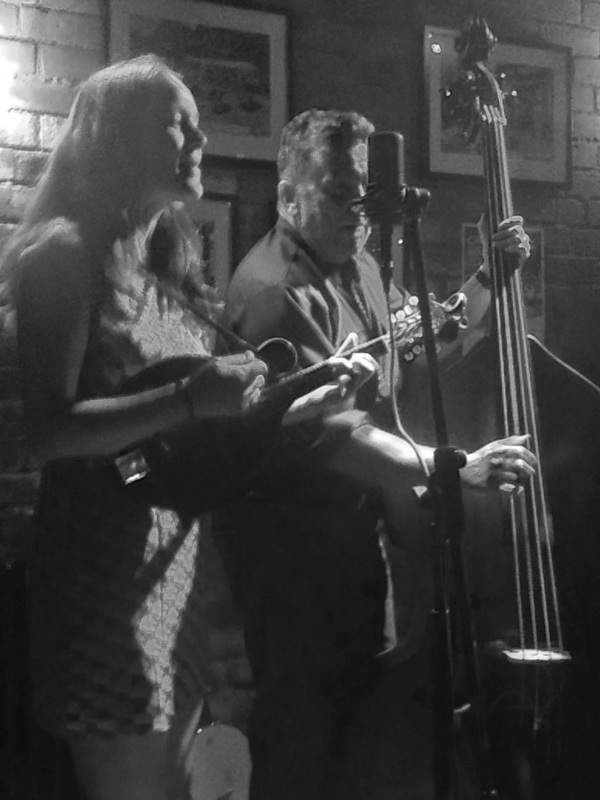 Hatful of Rain are a folk act shaped by a cross Atlantic theme and are as much influenced by bluegrass as to traditional English song. ‘Hop High’ and ‘Little Sadie’ fell into the latter camp while Fred’s ‘Superman’ saw the song’s subject get a bluegrass makeover. The whistles and hurdy gurdy may have been missing from the evening’s finale but the rousing ‘Little Bird’ enabled the audience to depart with a toe tapping spritely number lingering in their ears. The band didn’t desert their debut album totally and its title track ‘Way Up On The Hill’ opened the second half to show the slightly haunting side to their sound. On a lighter note, the album’s ‘Strawberry Leaves’ is chock full of sweet appeal and ‘The Exit Song’ shows the band at their elegant best. It was hard to fault any of the evening’s selections and the superb brickwork acoustics of the Kitchen Garden Café reverberated once again to some majestic roots music. One can only hope that this venture around the country sparks a sufficient level of interest to enable Hatful of Rain to make regular excursions from their southern base. They are far too good to be the south coast’s best kept secret and certainly challenge those in their presence not to be disappointed. The 40 minute sets are fine but the 90 minutes shows are a whole lot better.